Garage storage makes a big difference in the overall look and feel of your home. The right cabinets make it easy to find seasonal décor, stow tools or contain sports equipment. This prevents clutter from forming inside the home and ensures you have a place for everything. Boston Closet Company has helped transform countless garages from being completely unusable to being the hub of each family’s day. Here are a few solutions to consider if you want to make a big impact on your home with just a few changes. Whether you have a mudroom inside the home or have been improvising with a corner of the garage, shoe organization makes a big difference in the look and feel of a home. The right storage system offers plenty of space for family members and guests alike to store shoes of all sizes, whether you have snow boots or are enjoying sandal season. Workbenches should be as unique as the people who use them. Our team typically recommends cabinet installations beneath the workbench countertop itself to make use of as much storage space as possible. We then add shelves, overhead cabinets if desired, and vertical wall storage like gridwall or slatwall. This helps homeowners make the most of their living spaces and offers ample shelf space for a variety of uses. 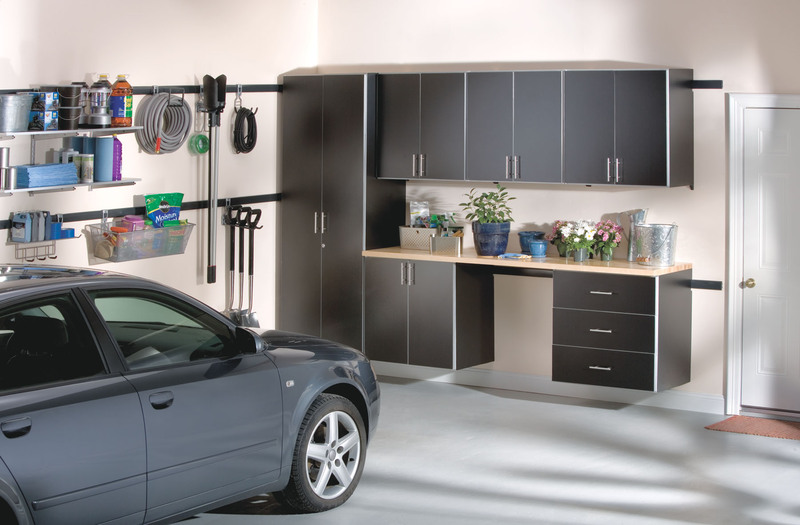 Slatwall, gridwall, and other vertical storage solutions make it possible for Boston homeowners to get more usable space from the garage. Invest in accessories like S-hooks or baskets to hold even more. This is a great idea for workbench areas or gardening centers, where small tools need to be accessible on a regular basis. No matter what your sport, it helps to have space dedicated to your hobbies in the garage. Basketballs, soccer balls, volleyballs, and footballs can all be corralled in a hanging ball basket to avoid losing equipment when cupboards are opened. Similarly, lacrosse sticks, bicycles, baseball bats, and ski gear can be hung on the wall. This helps protect your belongings and keeps everything accessible when the right season comes around. Heavy items like wheelbarrows and large rubber bins can – and should – be stored safely in the garage. This protects your belongings from the elements and helps prevent both mildew and rust. The key is to find heavy-duty shelving units and secure vertical storage to contain everything. It is important to do extensive research before making a purchase so you are sure that your storage system can withstand the weight of heavier objects. Start designing the garage of your dreams today with our designers on your side. Call 617-628-1150 or contact us online for a free in-home design consultation.